That is the name of a popular Japanese animation television series. It was Nagumo’s favorite show when he was a child. The series features huge, human-controlled machines in battle. Now Nagumo has made the show come to life. He has built a large robot inspired by the machines. The robot is called LW-Mononofu. The farming machinery company Sakakibara Kikai developed it. 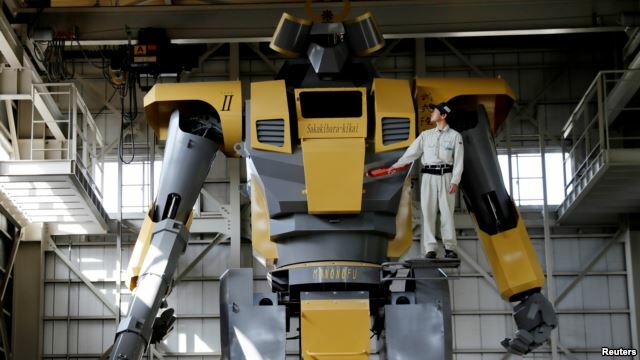 The robot is 8.5 meters tall, has two legs and weighs more than seven metric tons. 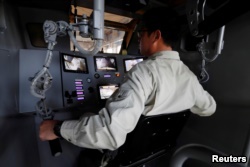 It has a seating area with monitors, and devices for the pilot to be able control the robot’s arms and legs. The 44-year-old Nagumo spoke to the Reuters news agency about the popularity of the “Mobile Suit Gundam” series. It inspired movies, manga, video games and more. And so, he suggested the robot could be popular as well. “I think this can be turned into a business opportunity,” Nagumo said. Sakakibara Kikai develops robots and entertainment machines in addition to its main agriculture equipment business. For a rate of about $930 an hour, people can rent the machines for children’s birthday parties and other events, Nagumo said. The company has created robots of all sizes. There is the almost 3.5-meter-tall Landwalker, the smaller Kid’s Walker Cyclops, and the MechBoxer boxing machine. But the Mononofu stands above them all. It also does more complex movements. It can move its fingers and turn its upper body, and walk forward and backward. However, it moves very slowly – at a speed of less than one kilometer per hour. Although it may be slow, the Mononofu is very powerful. The bazooka-like air gun on its right arm shoots balls of soft material at 140 kilometers per hour. 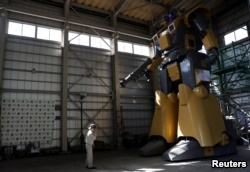 “As an anime-inspired robot that one can ride, I think this is the biggest in the world,” Nagumo said. But Mononofu might be a bit too large. It is unable to leave the factory without being taken apart because it was built taller than the entrance. Megumi Lim reported this story for the Reuters news service. Pete Musto adapted it for VOA Learning English. Ashley Thomspon was the editor. We want to hear from you. How have artists and engineers worked together to use science and technology for entertainment in your country? Write to us in the Comments Section or on our Facebook page.